I recently took a trip to Italy and decided to switch to an international data plan so I could take advantage of my Blackberry Storm while on vacation - and boy am I glad I did. GPS and Google Maps is truly a powerful combination. 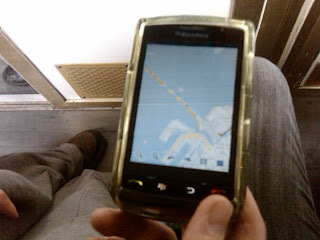 The beauty of Google Maps on a GPS-capable smartphone (like a Blackberry or iPhone) is that it pinpoints your location and allows you to search for basically anything within your vicinity. For instance, my partner and I were in Venice and craving Chinese food. I pulled up Google Maps on my phone and did a search for Chinese food. BAM! Within seconds we had walking directions to the closest restaurant. GPS and Google Maps also came in handy when we were looking for hotels, museums, train stations - or when we just got plain lost. The best part? Addresses were (for the most part) unnecessary! All we had to do was search for the name of the establishment and within seconds we were on our way, following our little glowing blue dot along the map. This was especially handy in a foreign country where the address system didn't always make sense to us. Overall, we felt more comfortable making spontaneous decisions as we always had a birds-eye view of our location. Joe Says: Always use caution when traveling in unfamiliar areas. While GPS and Google Maps are great tools for international travel, they don't inform you of sketchy areas or construction zones. Use common sense and when in doubt, turn around.